Apple iPod Classic 6th Generation Silver 80GB - New Battery Works Great! IPod has passed a high-standard comprehensive test which covers all aspects of the iPod's functionality. iPod is in great condition as seen in the pictures! New battery installed and works great! iPod shows signs of normal use such as: light scratches on front and back, very minor dings on the sides. Trending at $138.94eBay determines this price through a machine learned model of the product's sale prices within the last 90 days. Apple A1238 iPod Classic 80GB MP3 Player Used With Free Shipping. Condition is Used. see pictures scratches and marks all over but screen is in relatively good order. Works good make an offer! Shipped with USPS First Class Package. Apple iPod classic 7th Generation Silver (120 GB). Condition is Manufacturer refurbished. Shipped with USPS First Class Package. Its in amazing condition. New refurbished . Works super smooth ! Doesnt come with accesories . Buttons on point . Just the ipod by its self. I accept returns if ipod isnt functional . Contact me before a return case . Id be glad to help you out . I give you a replacement or money back. IPod has passed a high-standard comprehensive test which covers all aspects of the iPod's functionality. iPod is in excellent condition as seen in the pictures! New battery installed and works great! Besides the scratches that the iPod has, there are no major issues with the iPod. Apple iPod classic 6th Generation Silver (80 GB) Color Screen Working! Works great, includes USB charge cable. Cleaned, but light scratches all over. See pictures. Huge 80GB storage capacity. Feel free to ask me any questions, thanks! APPLE IPOD CLASSIC 7TH GENERATION - 120GB - SILVER. Used, 100% tested and fully functional. Physical Condition: 7.5/10. Front: Heavy scratches and nicks. Apple iPod Classic 6th Gen Generation Silver 160GB. Excellent condition. Comes with iPod and two charging cables. No box or other packaging. Condition is Used. Shipped with USPS First Class Package. IPod is in beautiful shape. 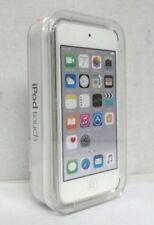 Nice iPod Classic by Apple model 7th generation / A1238 / 160GB / MC293LL/A in silver. It is in used condition and fully functions as designed. The iPod does show scuffs and scratches throughout (see pictures) but this does not affect it's function. Apple iPod classic 7th Generation Silver (160 GB). Condition is Seller refurbished. Shipped with USPS First Class Package. Storage- 80GB. Series/Version - 6th generation. SALE INCLUDES: Apple iPod. Lock Status. No other accessories are included in this sale. Unless noted or pictured power cords and/or adapters are not included. Apple iPod classic 6th Generation Silver (80 GB). Condition is Used. Shipped with USPS First Class Package. Used with normal wear marks. Apple iPod Classic Silver 160gb (Used) mp3/music player. IPod Classic 160gb (Used) in clear protective case. Condition is gently used but in great shape inside a clear, protective case. 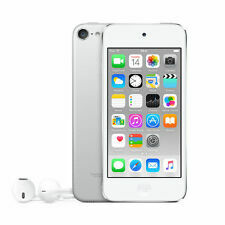 You Will Be Buying Apple iPod classic 7th Generation Silver (160 GB) A1238. It has been thoroughly cleaned and tested and works as good as new. Condition is Used. Model Number : MC293LL. Color Screen in good condition. Includes IPOD Classic USB cable and Apple 120VAC USB charging cube. Also includes a gel sleeve to protect unit from dropping. Condition is Used, works well. Unit only. Battery strong and no songs on. Generation: 6th. Category: iPod. Item is tested to work with great battery life! Item you will receive may not be the exact item in the pictures but it will one of similar condition. INCLUDED IS ALL THAT IS PICTURED ! DON'T MISS THIS TREASURE ! Apple IPod Classic 160gb Silver 7th Generation. 1 X ipod classic video ( 160gb Apple 7th Gen ipod Classic ). 1 ： It is the 7th gen latest model ! 1 X Usb cable. This is an Apple iPod Classic 6th generation. It is 80GB and silver in color. Battery holds charge good and although for some minor scratches on the back it is in good condition. Comes with everything you see. It is missing the AC adaptor that you plug the USB into to charge in wall outlet. What you see pictured is what you get. PAYMENT TERMS: * If you are the winning bid, payment is expected within 2 days! * PayPal payment is preferred. SHIPPING: * Shipping is within the United States ONLY please. * All items will be shipped USPS Priority Mail (unless otherwise stated in shipping info). All packages shipped First Class will be shipped in a poly mailer and item will be wrapped in bubble wrap. Apple iPod classic 6th Generation Silver (80 GB) Please read Description!!! Up for sale is a iPod classic 6th gen 80gb silver model. This iPod is in good shape and works just fine. It is used and deviously had a inscription but has been drilled off. This sale includes brand new Apple EarPods and a slightly used charge cable. No wall charger included. This model holds a decent charge on the battery but has not been tested for longevity. iPod is sold ASIS. Please refer to pictures for details. Item will be shipped same day or next business day after confirmed payment. If you have any questions please feel free to ask. Thanks for looking!!! The battery is weak and will need replaced. You will get exactly what is pictured. iPod Classic 7th Gen SSD 256GB Silver Custom (160 GB) (Latest Model) Warranty!